LOCAL experts from Belfast and the South Eastern Health and Social Care Trust areas attended a workshop organised by the Public Health Agency (PHA) last week to hear from Dr Annette Beautrais a World Health Organisation lead on international suicide prevention strategy. The workshops brought together local experts to hear from Dr Beautrais on identifying the key areas that need to be included in government policy, this will be central to future planning, in tackling suicide. 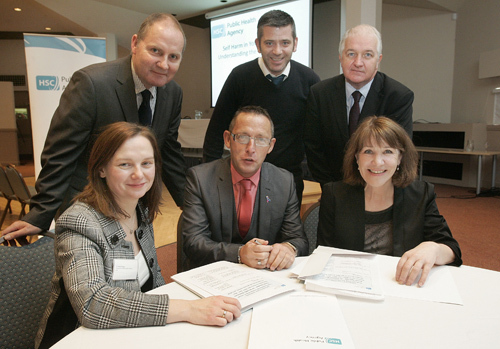 Back row, Gerard Collins, Health Improvement Policy Branch, DHSSPS; Joe McKane, Head of Department for Mental Health and Wellbeing, FASA; Aidan Murray, Assistant Director Mental Health and Learning Disability, HSCB. Front row, Dr Denise O’Hagan, Consultant in Public Health Medicine, PHA; Brendan Bonner, Head of Health & Social Wellbeing Improvement, PHA; Key Note speaker: Dr Annette Beautrais, University of Otago, New Zealand & Yale University, USA.